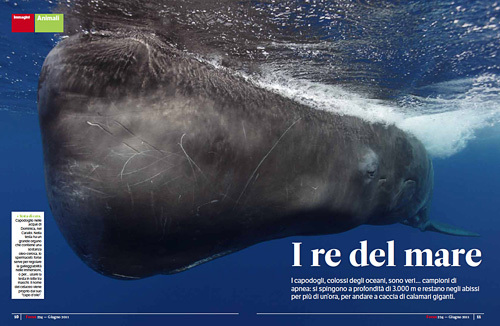 If you happen to read Italian, here is a link to a PDF file of a pictorial on sperm whales that appeared in Focus Magazine Italy's summer issue: Focus Magazine Sperm Whale Feature, Summer 2011 (350kB). It's the first time I've worked with this publication. I have to say that they are a truly friendly and professional team that made the process of working long-distance a pleasant experience.